Trucking Company Negligence in Houston - The Gerardo Cantu Law Firm, P.C. Have you or a family member been injured in a truck accident? It may have been the result of the trucking company’s negligence. Failing to follow industry regulations, hiring unsafe drivers, and failing to provide proper vehicle maintenance are all common causes of truck accident injuries and wrongful death. At The Gerardo Cantu Law Firm, P.C., our personal injury lawyer have more than 12 years of experience handling truck accident cases. I will hold truck companies responsible for their actions. We will fight for maximum compensation on your behalf. Contact us today for a free consultation. You pay nothing unless we win your case. At the Gerardo Cantu Law Firm, P.C. in Houston, Texas, we handle all trucking company negligence cases on a contingency basis. 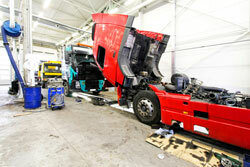 Initial investigation of the accident is an important step in proving truck company liability. There needs to be concrete evidence that the truck company’s negligence played a significant role in causing the accident. Our Houston truck accident attorneys, investigators, and experts can unravel the facts. We interview witnesses, subpoena log books, and gather reports to build our case. We immediately take action to preserve evidence such as poorly maintained parts. We use this evidence to put together a strong case that tells your story. Taking immediate action in these cases is necessary. Waiting too long can decrease our chances of obtaining the evidence we need. Let us begin representing your interests today. Contact us for a free consultation by calling us or sending us an e-mail. Get in touch with us today to discuss your Houston trucking company negligence accident case with an experienced attorney.